In previous posts I’ve written about our efforts to climb some peaks in the Apennines earlier this year, including two attempts on the highest mountain in peninsula Italy, 2912m Corno Grande, once from the north side and again from the south, and an attempt on 2348m Monte Sirente. 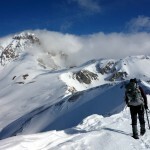 Although these were enjoyable reconnaissance climbs, we failed to reach the summit of either peak for reasons which can broadly put down to the snow conditions. 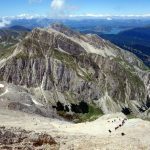 The Apennines in that part of Italy (Abruzzo) receive several metres of snow in winter, slowing our progress and on one occasion producing unsuitable avalanche-laden slopes. We were determined to get up Corno Grande, and after Edita returned to Rome after her two-month stint in Nepal, assisting the World Food Programme (WFP) with their response to the earthquake, we set off immediately for our third attempt. You what, you climbed that thing? Piss off! Corno Grande from Campo Imperatore. The Apennines are a different range in summer, so different that they could be on another continent. Winter climbs with uncertain conditions and a measure of risk become straightforward hill walks, but that’s fine. 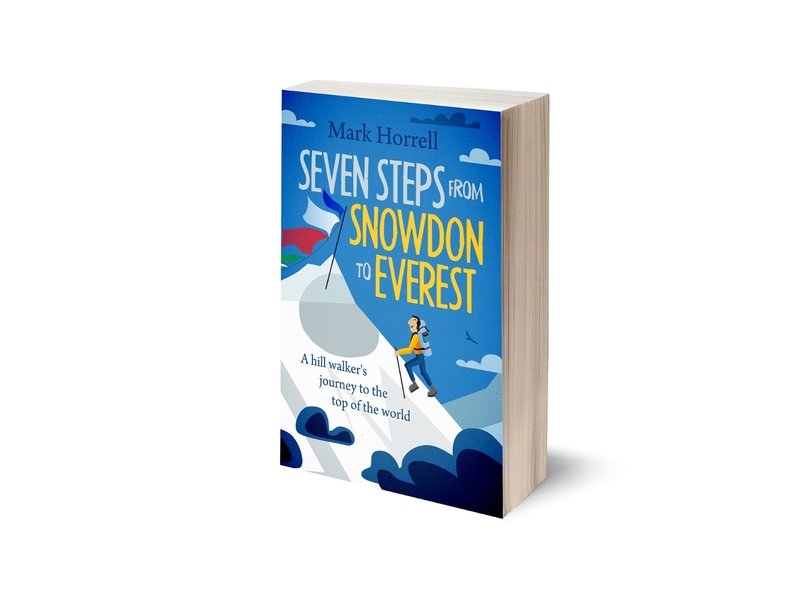 I started my outdoor journey as a hill walker, and I will remain one for as long as I can walk. The mountain that had given us such trouble back in January and February became an enjoyable appetiser in what was to be a feast of mountain hiking. The Italians don’t seem to have a hill-walking culture like we have in the UK. We’ve often had mountains pretty much to ourselves, which would be crowded with people back home. The one exception is Corno Grande, which is Italy’s Snowdon, but without the train. The standard route, or Via Normale, starts on the south side from a place called Campo Imperatore, a vast grassy high-altitude plain, with a hotel and ski resort at its top end, 2100m above sea level. In February the road was impassable, and we took a cable car crowded with skiers up from Fonte Cerreto 1000m below. This time we were able to drive. In February there was no sign of the Via Normale. It was buried under metres of snow, and in fact had become a ski run. There were no footprints to follow, and we had to take an alternative route along a wonderfully narrow snow ridge. On this occasion there was an obvious easy path hewn into the hillside beneath our ridge, a path which some people were even biking up. The path led to a col, Sella Monte Aquila, on another high plateau at the bottom of our ridge. 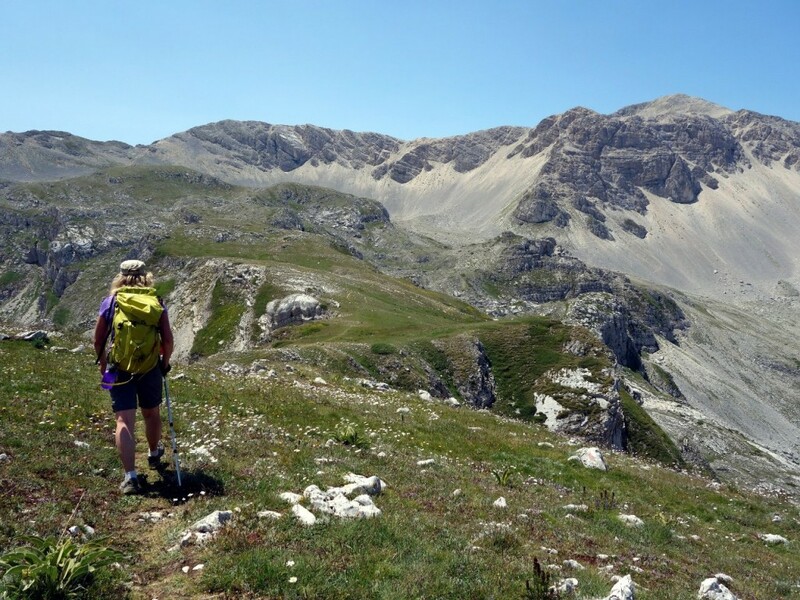 In February we eyed possible routes across this plateau to the foot of Corno Grande’s southwest shoulder. We knew that a trail led up to the shoulder, but the slopes were lined with avalanche debris. We waded through knee-deep snow to the base of the shoulder, and dug a snow pit which lifted up a layer of snow as easily as peeling a banana. This helped to explain why there were no footprints up to the shoulder, and why hundreds of people were busy skiing at Campo Imperatore while only two were contemplating climbing Corno Grande. We turned around and plodded up nearby Monte Aquila as a consolation peak. 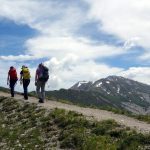 There were still patches of snow on the plateau above Sella Monte Aquila last week, but also a broad trail across grassy slopes emblazoned with colourful wild flowers. The avalanche slope was now a zigzag path up scree, and soon we were at the top of the shoulder, high above the surrounding mountains, with the exception of the smooth stony crown of Pizzo d’Intermesoli across the valley to the west. The trail climbed a little higher up the shoulder to a small basin beneath the west peak of Corno Grande, the highest of its three summits. The Via Normale crossed this basin before zigzagging up scree slopes on the far side. 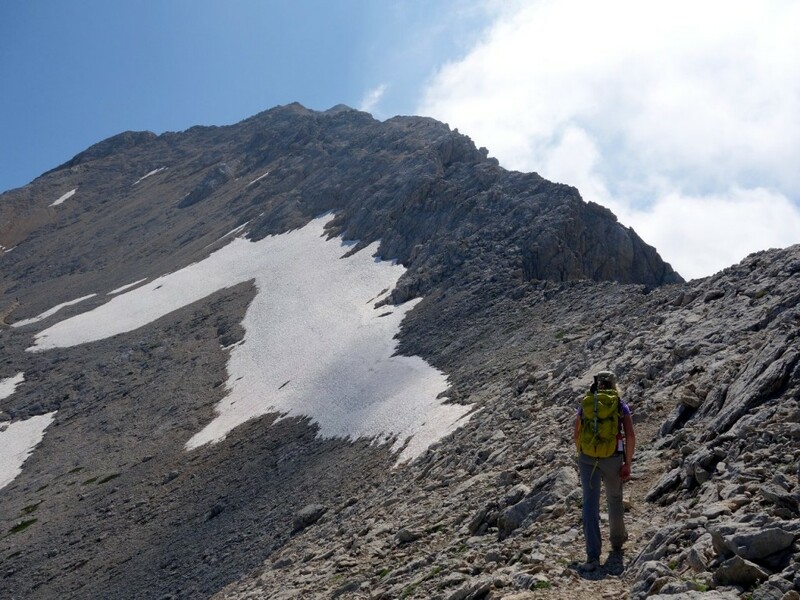 We decided to veer off to the right to climb the west ridge, a jagged dinosaur-back of rock which promised better views, fewer people, and some exhilarating scrambling. Although the ridge was exposed and a fall would have had serious consequences, the scrambling was easy, and there was even the occasional iron handrail bolted into the rock to assist. The route was marked by red and white paint marks and wandered from left to right of the ridge, rarely keeping to the crest. We met a few people going up and coming down, but nothing to compare with the hordes we could see crawling up the Via Normale across the basin to our left. It was an enjoyable scramble, but over all too soon. In next to no time we rejoined the Via Normale as we entered thin clouds. Although we no longer had a view, it wasn’t hard to know when we reached the summit. As well as the big iron cross you find at the top of every Italian mountain, there were about 50 other people squeezed between rocks and eating their panini. We waited our turn for a summit photo and found a small space to sit down for a snack of our own. 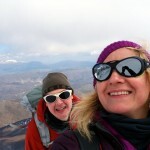 It had taken us just 2½ hours to reach the summit from the car park at Campo Imperatore. It had taken us three attempts to get there, but on the third we hardly broke sweat. We took the Via Normale back down to the basin. Just before it joins the west ridge there is a short traverse with views across to Corno Grande’s east and central peaks, lower than the west peak but a little trickier to climb. We could see figures on top of both, but could not see whether the routes were a rock climb or a difficult scramble. About 200m below us, in the gap between all three peaks, was the tiny Calderone Glacier, which we understand is the most southerly in Italy. It probably won’t be around for much longer. On the way up we were surprised to see people with climbing helmets strapped to their rucksacks, and now we understood why. 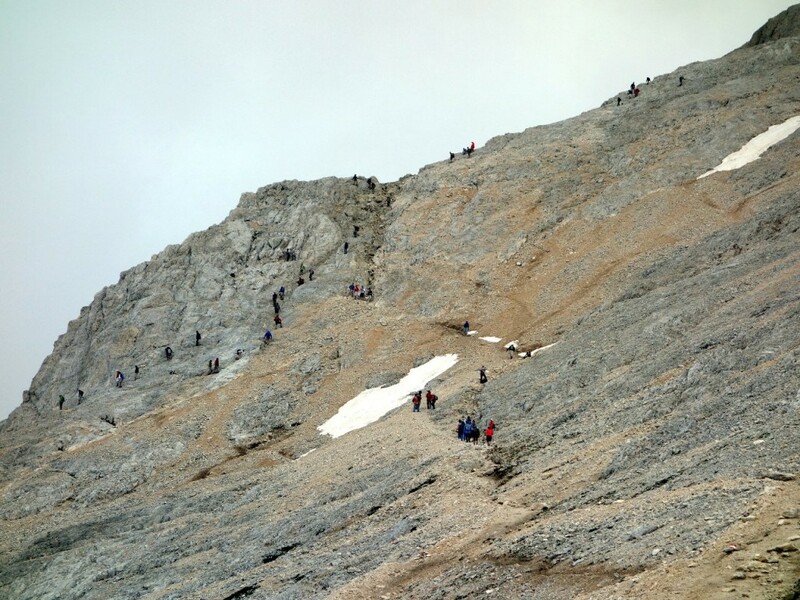 So many people climb Corno Grande by Via Normale that it’s become one of those scree slopes where most of the stones have slid down gradually over the years, leaving just a few loose pebbles on the surface, pebbles which can easily be kicked down onto people below. We took care, sometimes adopting the “bum first” method of sitting down and lowering ourselves onto the rock below. Looking back up from the basin we could see dozens of black figures scrambling up and down the route, the kind of human line that sends some armchair Everest watchers incandescent with rage. You see it often enough on popular British hills, but this is the first time we had seen this phenomenon in Italy. We ambled back to the car park, taking in the view as we descended. It was a short climb, but a memorable one. 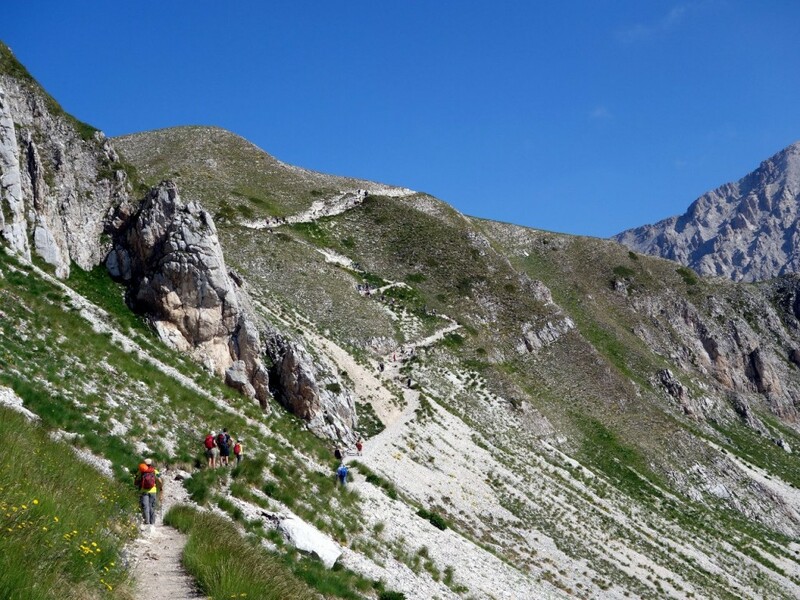 There are other routes and other peaks on Corno Grande, and we will probably return. 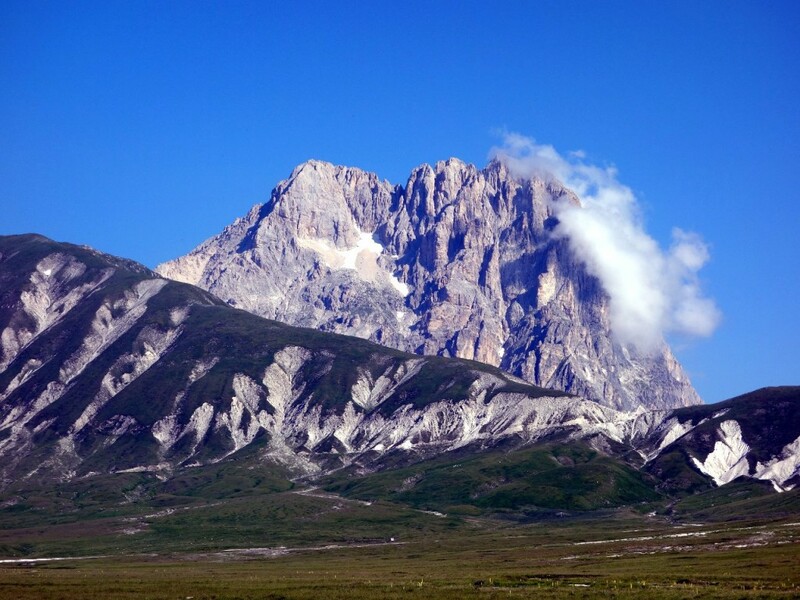 Corno Grande is the highest point in the Gran Sasso massif, on the northern fringes of Italy’s Abruzzo region. We drove south to the next range along, Sirente-Velino, and spent three days there exploring more peaks and walks. 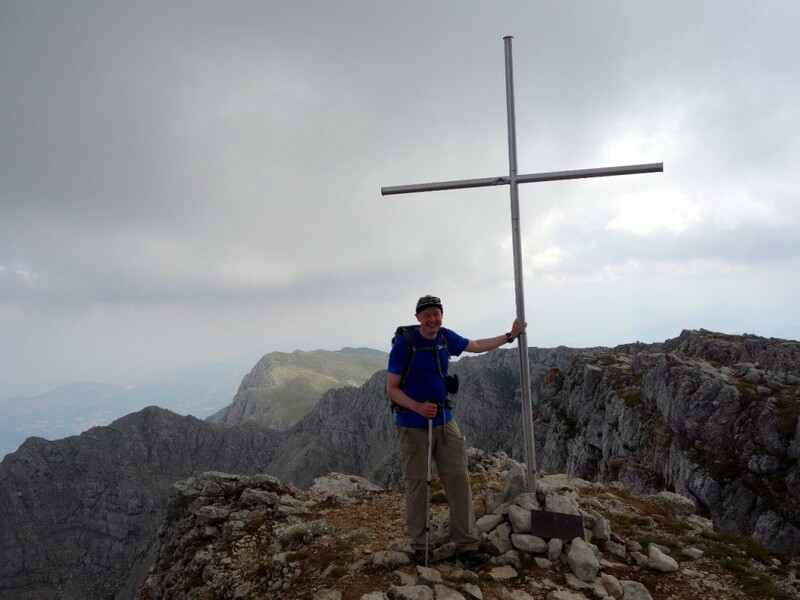 The following day we climbed Monte Velino, at 2486m the highest peak in the range. It was a memorable walk starting in a high-altitude plain at the end of a 5km dirt track. The trail rose through beech woods to a delightful green valley. 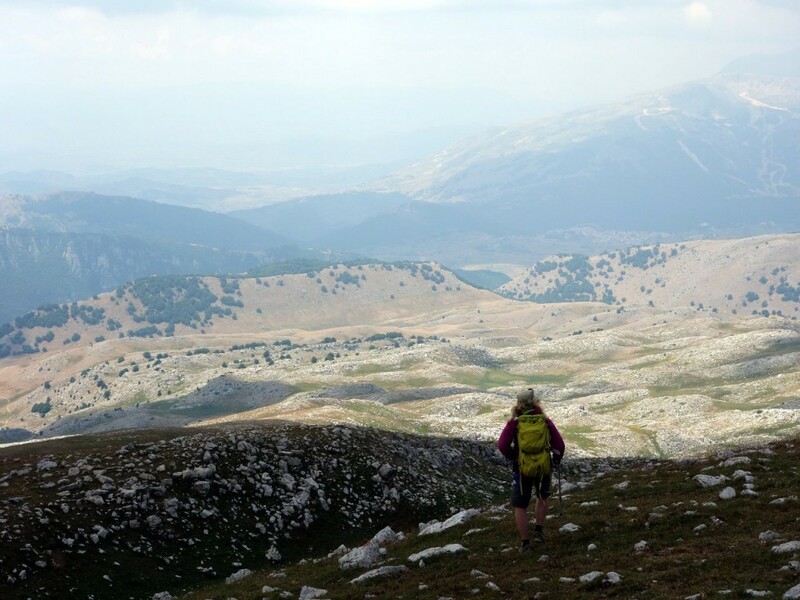 We climbed up to a col and had a fantastic roof-of-the-world, horseshoe-shaped ridge walk, as we followed it around to distant Monte Velino on the opposite side of a deep valley. While most of Corno Grande’s climb had been up barren rocky slopes, this walk was pleasantly green, except for Monte Velino itself, which from a distance looked like the surface of the moon. But when we got there we found its rocky slopes teeming with colourful wild flowers of purple, yellow and white, wedged in unlikely crevices. 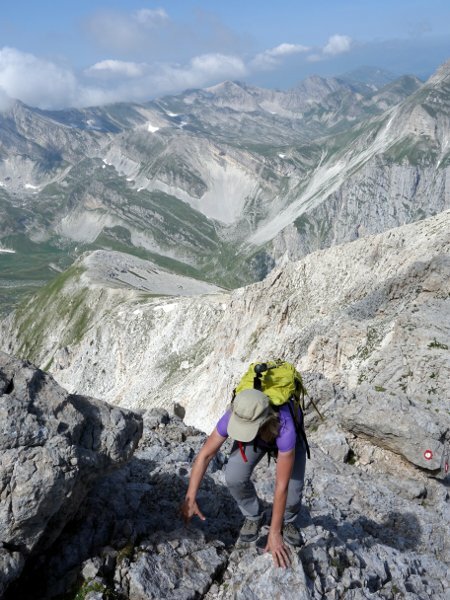 On the third day we climbed 2348m Monte Sirente, another mountain that had given us difficulty earlier in the year. We tried to climb it from the east side, which involved looking for a practical snow gully between steep cliffs. Monte Sirente can more properly be described as an escarpment rather than a mountain. On its western side it rises gradually on grassy rock-strewn slopes which terminate abruptly at the edge of a precipice. I let Edita lead the way when we tried to climb Monte Sirente back in March. She was about to try and climb Lhotse in the Himalayas, and I figured that breaking trail through knee-deep snow would be good training for her. She didn’t seem to mind. This time I let her lead because her eyesight seemed to be better at spotting the faded paint marks on rocks which marked the trail. My contribution was to map read, a skill I have learned in Britain using Ordnance Survey maps – maps that are so detailed and up-to-date that if you dropped a pickle from your sandwich while stopping to eat somewhere on a hillside then it would probably appear on the next edition. The 1:25,000 Edizioni il Lupo maps I have for this part of Italy are pretty good, but sometimes the features that are marked don’t match conditions on the ground. I have frequently had problems finding a route through villages and forests at the start of a trail until we’ve picked up the paint marks higher up. Having said that, on Monte Velino I did manage to miss a signpost so obvious it could have been singing God Save The Queen to attract my attention as I walked past. On Monte Sirente a footpath which was marked on the map had somehow gone AWOL, and this confused me at the start of the walk. Edita speaks something like six languages to varying degrees, and at this point I took the opportunity to expand her English with some of our more unusual profanities until we rose above the forest and I could see where we were. The paint marks weren’t really needed on Monte Sirente’s western flank. Once above the treeline you simply continue for 500m up a big grassy slope until it ends at a 500m cliff. If you miss the summit then you will know about it for a few seconds as you are falling. From the top there was a fantastic view down into the enormous Piano delle Rocche, and we could almost see our hotel 1000m below us. On the fourth day I had to catch my flight back from Rome in the evening, so instead of climbing another big hill we did a shorter walk up the Celano Gorge, a valley so narrow it would make the mind of a Daily Mail reader seem as broad as the Mediterranean Sea. 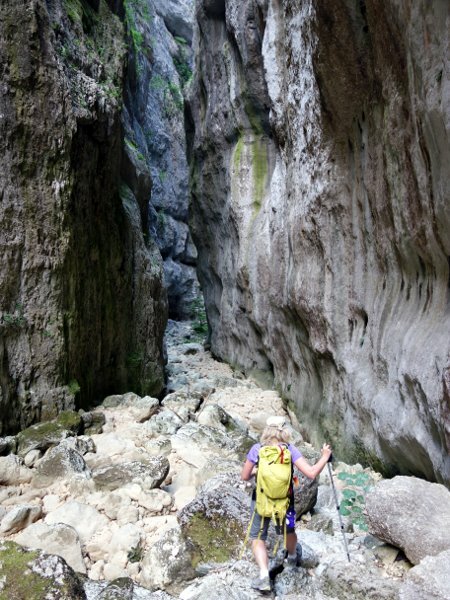 The gorge is impassable in winter, and my guide book told me if there was more than a trickle of water in the stream bed at its mouth then there would be no point in continuing. We soon discovered why. At its widest it was no more than 50m across, and its narrower sections were more like 3m, with vertical cliffs 50 times higher on either side. We were literally scrambling over rocks in a dry stream bed. Where pockets of sunlight penetrated, a narrow strip of beech forest had sprung up on the valley floor. My guide book also promised a waterfall a couple of hours up the gorge, which seemed about as likely as finding a glacier there. We hadn’t seen as much as a drop of water in any of the surrounding hills over the last three days, and we were surprised when the sound of running water penetrated the trees and the waterfall duly appeared. Where on earth it went afterwards remained a mystery. I only discovered the Abruzzo region of Italy a few months ago. It’s now becoming familiar, but it never ceases to surprise me. It’s a hill walker’s paradise: a feast of accessible mountains twice as high as we have in the UK clustered over a wide area. The weather is a hundred times better, but at that altitude the climate is comfortable too. There is a network of well-marked trails which hardly anybody uses. There were crowds on Corno Grande, but over the next few days we hardly saw another soul. All three of our mountains were very different, and we had two of them completely to ourselves. If you enjoy hill walking then get yourself over there. Did I mention the prosciutto and formaggio panini for your lunchtime snack, and vino rosso in the evening? You can see all my photos from our trip in my Flickr album. Thanks for this blog Mark, loved it. We are off there next week, so doing some research. Informative, witty and very well put together. What do you think the prospects are for ice climbing in the Celano Gorge? Looks suitably steep, dark and damp! I don’t know, sorry. I’m a hiker rather than a climber. I’ve not been there in winter, but I’m guessing you may have difficulty accessing the cliffs, as the gorge itself will be flooded.